England rugby meets england hockey! Softball, field hockey, rugby compilation. Jemma playing the games she loves. A tale of two Sessions - Start with a half hour conditioning introduction and then progress onto the Attacking Patterns finale! This training programme is focused purely on the conditioning of your squad. Banish bad habits and give your players plenty of time to practice carrying the ball in contact! Where do I start? 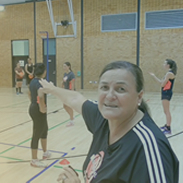 Try our introduction to the season session - working on Option Plays and Basic Skills!